In late April and early May, once the oaks, the maples, the poplars begin spreading out new green leaves to create a concealing woodland canopy, a familiar song can be heard from the treetops. Upon first hearing it, listeners might mistake the hidden singer for an American Robin. Listen a little closer, however, and the song sounds as if it is being delivered by a hoarse robin with a sore throat. The producer of the hoarse but melodic song is a Scarlet Tanager, one of the most showy birds of Eastern woodlands from April to early October. Like the warblers, vireos, flycatchers and other songbirds, the Scarlet Tanager is migratory. They spend the winter months in the tropical forests of Central and South America. The Scarlet Tanager is better attired than most birds to provide us a glimpse of what life must be like in the tropical rain forests, which are a riot of color and sound. It takes only one sighting to sear the vision of these vibrant birds into our retinas, as well as into our memories. The Scarlet Tanager boasts a brilliant plumage of crimson red paired with black wings and tail. Of course, this is the male. The female Scarlet Tanager makes no real claim to the common name with her comparatively drab greenish plumage. However, the scientific name, Piranga olivacea, gives a nod to the olive-green plumage of females, young males and even adult males when molting their feathers. Although once nominated as a candidate for state bird by the school children of Minnesota, the Scarlet Tanager ultimately failed to gain the designation. Instead, as perhaps is fitting for the “Land of 10,000 Lakes,” the Common Loon represents Minnesota as official state bird. The related Summer Tanager is less widespread in Northeast Tennessee, but males of this species are no less dramatic in appearance than the Scarlet Tanager. Male Summer Tanagers are a rosy-red over all their body. Females, with a dull greenish plumage, are relegated to the background. She can be distinguished from her counterpart, the Scarlet Tanager, because of their darker wings and larger bills. 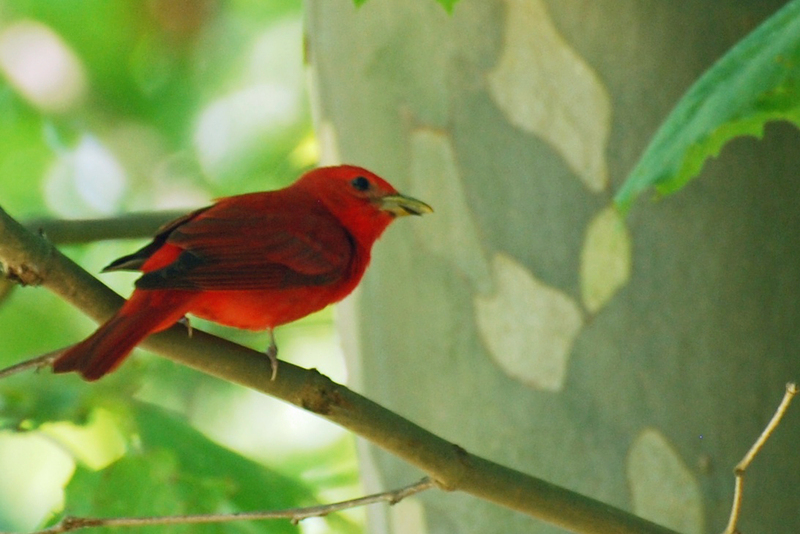 The Summer Tanager is the only all-red bird in North America. It is less common in Northeast Tennessee than the related Scarlet Tanager. The Summer Tanager holds the distinction of being the only all-red bird in North America. Birds like Northern Cardinals and Scarlet Tanagers also have some black in their plumage. 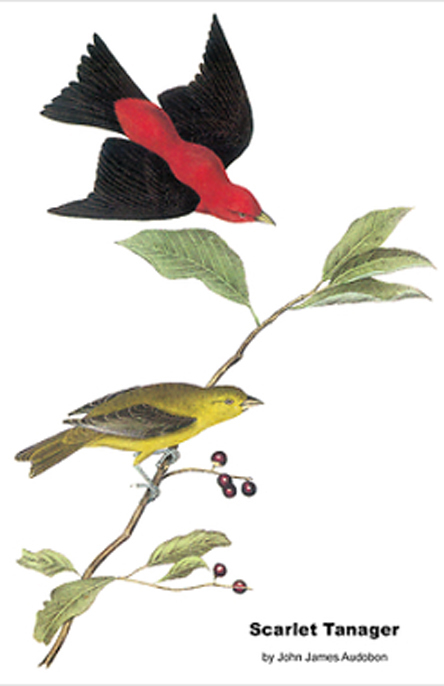 I’ve seen Summer Tanagers at Steele Creek Park in Bristol and Willow Springs Park in Johnson City. Sadly, over the years my sightings of this attractive songbird have been few and far between. My best sighting of a male Summer Tanager took place during a spring visit to Fripp Island, S.C., many years ago. Most of the Summer Tanagers I have observed in Northeast Tennessee have been females. On the other hand, I usually have a few Scarlet Tanagers in residence around my home during the summer months. If the woodlands at my home fail to attract this bird, I can usually make a visit to higher elevations on Roan Mountain and Holston Mountain to gain an exciting glimpse of this beautiful bird. Worldwide, there have traditionally been about 240 species of tanagers. Experts have changed some of the ways they classify tanagers, so that figure is no longer set in stone. Tanagers are a New World family of birds, concentrated mainly in the tropics. In the western United States, the Scarlet and Summer Tanagers are replaced by Western Tanagers and Hepatic Tanagers. During a visit to Salt Lake City in Utah in 2006 I saw several Western Tanagers. Some of the world’s other tanagers are known by extremely descriptive names, including Flame-colored Tanager, Green-headed Tanager, Golden-chevroned Tanager, Azure-shouldered Tanager, Fawn-breasted Tanager, Saffron-crowned Tanager, Metallic-green Tanager, Turquoise Tanager, Scarlet-bellied Mountain Tanager and Diademed Tanager. Scientists, who have to occupy themselves, have recently given fresh consideration to the relationship of many tanagers to the other birds of the world. As a result, many of the North American tanagers are now closely allied with such birds as Northern Cardinals and more remote from tropical tanagers. The Scarlet Tanager is not typically a feeder visitor, but you can lure these birds with orange slices placed in special feeders or simply spiked onto the branches of backyard trees. As an added bonus, orange slices can also attract birds such as Baltimore Orioles and Gray Catbirds. Fond of fruit, the Scarlet Tanager incorporates various berries into its diet. Landscape around your home with fruit-bearing trees such as mulberry, serviceberry and wild cherry to make your yard more inviting to these elusive bird. Yes, the Scarlet Tanager is more often heard than seen, but it is a bird worth seeking out. A sighting of one will amaze you. I love to hear from readers. Just post comments on my blog at ourfinefeatheredfriends.wordpress.com. You can also reach me on Facebook or send email to ahoodedwarbler@aol.com. Please share the link to the blog with others who might be interested in the topic of birds and birding in Northeast Tennessee. This entry was posted in Birding, Birds and tagged Carter County Compass, Elizabethton Star, Migrants, Neotropical migrants, Piranga, Piranga olivacea, Scarlet Tanager, Summer Tanager, Tanagers, The Erwin Record, Tropical birds on May 18, 2014 by Bryan Stevens.